On MSNBC’s Morning Joe today, Steven Rattner assessed President Trump’s promise to Make America Great Again. 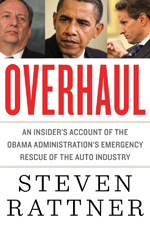 In a series of charts, he shed light on the state of economic growth (sub-3% and slowing), jobs in the manufacturing sector (little changed), federal deficit (exploding) and stock market performance (average). In his State of the Union address on Tuesday night, President Trump will surely try to take credit – as he does with regularity – for a robust economy. But how strong really is the economy? 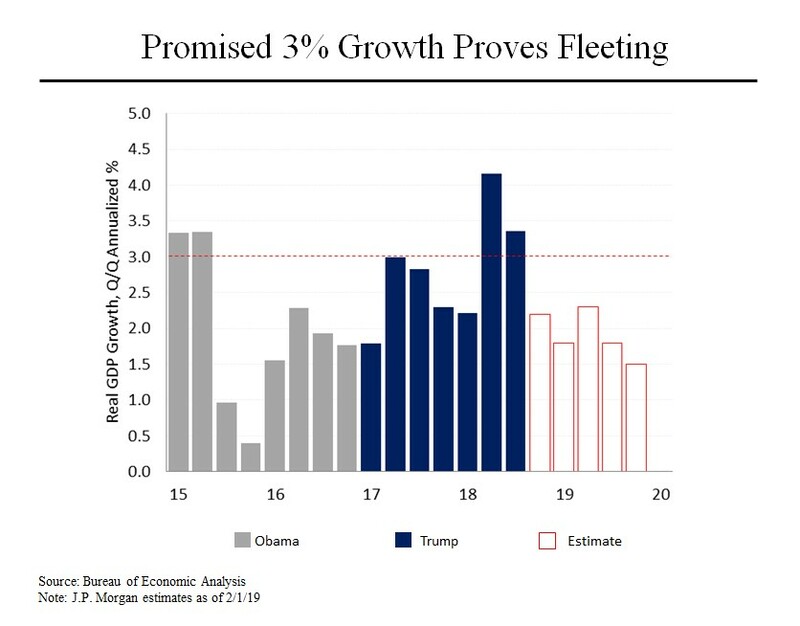 During the 2016 campaign and in the early days of his administration, Mr. Trump regularly promised that his tax cut and other economic policies would produce economic growth in excess of 3 percent, well above the recent trend of around 2 percent. In actuality, growth has only exceeded 3 percent in two quarters (it matched 3 percent in one such period) and is diminishing rapidly. In the fourth quarter of last year, growth was estimated by JP Morgan to have been 2.2 percent. (Official numbers have been delayed by the government shutdown). In 2019, the bank is projecting even lower growth, down to a 1.5 percent rate by the end of the year. (The White House continues to cling to its 3 percent plus forecast). Yes, a lot of jobs have been created in the last two years (304,000 in December alone). But job creation over the course of Mr. Trump’s first 25 months in office has actually been slightly slower than during President Obama’s last 25 months in office. Meanwhile, the federal budget deficit, which had declined sharply from its run up during the financial crisis, has exploded thanks to the Republicans’ tax cut and the bipartisan decision to abandon any spending restraint. By next year, the gap will likely once again exceed $1 trillion. And the news only gets worse from there. 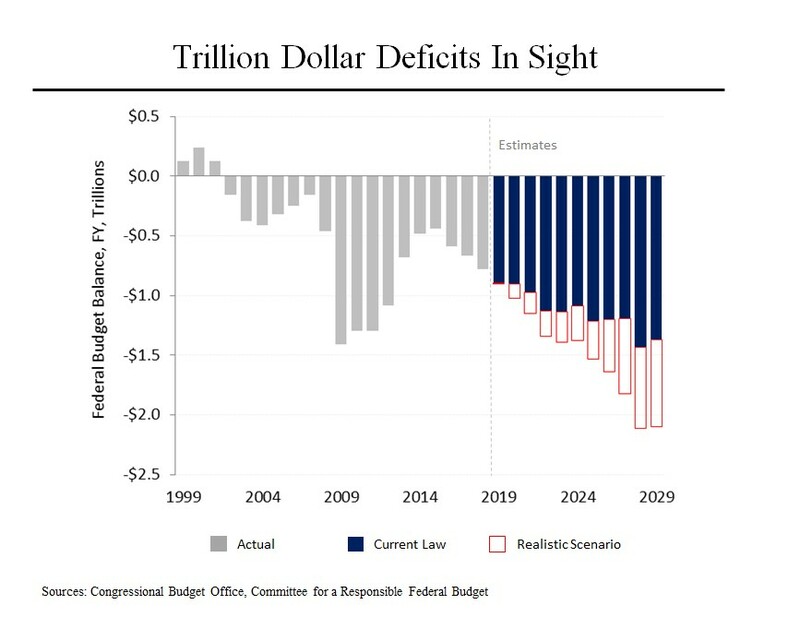 Assuming that the tax cuts and most other current policies are extended, the Congressional Budget Office estimates that the deficit could exceed $2 trillion less than a decade from now. That would mean more than $12 trillion of additional debt on the nation’s balance sheet by 2029. Central to Mr. Trump’s promise to Make America Great Again was his emphasis on restoring manufacturing jobs. 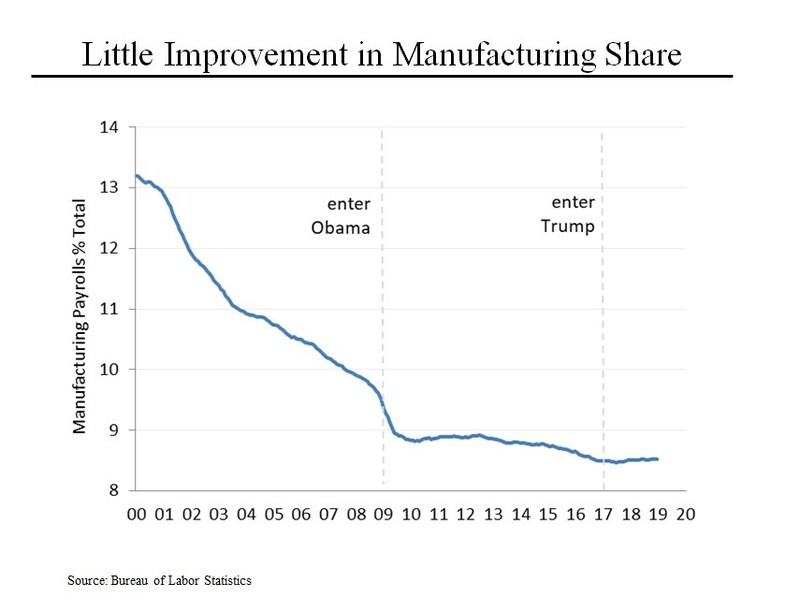 But manufacturing jobs as a share of overall employment, which was over 13 percent in 2000, has barely budged since Mr. Trump arrived from its 8.5 percent current level. While it’s true that in the past two years, about 500,000 such jobs have been added, that’s just a fraction of the 5.5 million that were lost between 2000 and 2010. 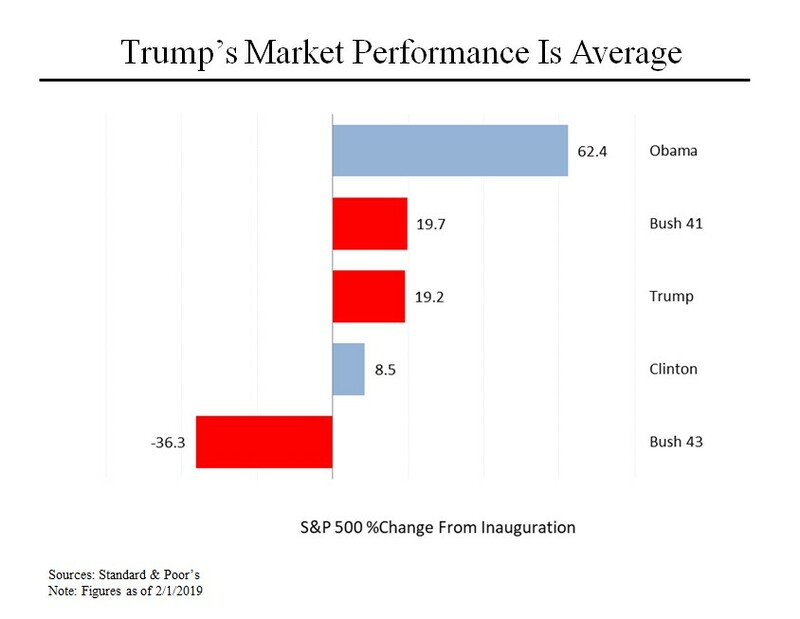 Another favorite boast of Mr. Trump has been about the stock market performance. But while the Standard & Poor’s index is up a handsome 19.2 percent over the past two years, that only puts its result in the middle of the pack among the five most recent presidents.